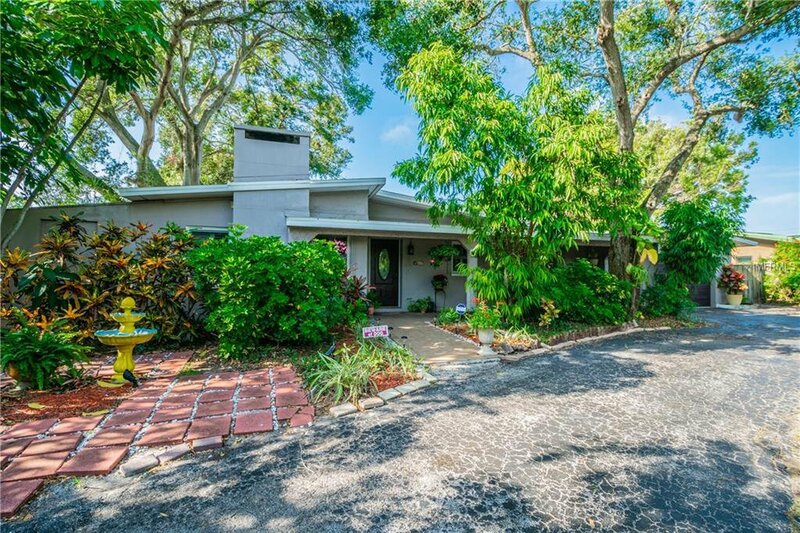 Don’t miss the opportunity to own this beautifully secluded home in Harbor Bluffs. This 3BR/2BA home sits among the most natural setting of lush landscaping and boast a magnificent, private back yard, large enough for a pool. The home is bright and open - lush wood floors throughout with the exception of tile floors in the Kitchen, Bathrooms and private Master Suite. Spacious living room with gas fireplace opens to dining room with entire living area showing off spectacular vaulted ceilings. The newer windows offer tons of natural light and are custom fitted with Plantation Shutters. The French Door off the living room opens to an outdoor private sitting area for relaxing comfort. All bedrooms have glass sliders also fitted with custom Plantation Shutters opening to an expansive paved patio area and an over-sized screened lanai off the Master Suite. Cooks Kitchen features the most sought after gas stove/range, massive amounts of counter space & cabinets, accented with a beautiful Pot Hanger. There is an eat-in area in the kitchen perfect for family time and bird watching from the picture window expanding the entire Kitchen. A Large Front Porch with new roof welcomes guest from the circular driveway surrounded by loads of natural landscaping. This home is conveniently located to shopping, restaurants and best of all just minutes to the beautiful Gulf Beaches. Call for your own private showing today! Listing courtesy of FUTURE HOME REALTY INC. Selling Office: RE/MAX METRO.